UK houses: Why Romney was partly correct. See full article in The Economist here. The first part of his insult confuses the island of Britain with England. Small houses. However he is correct about the size of houses in England and the UK, they are very small compared to their peers in Europe and the rest of the World. 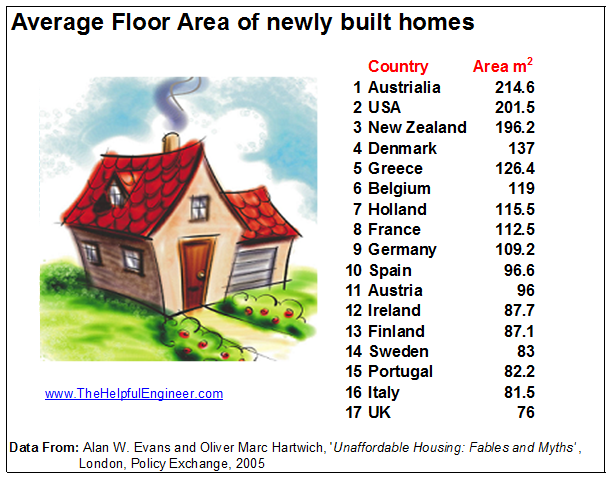 According to ‘Unaffordable Housing: Fables and Myths’ by Evans and Hartwich, the UK has the smallest house size by area of those they compared, see table below. 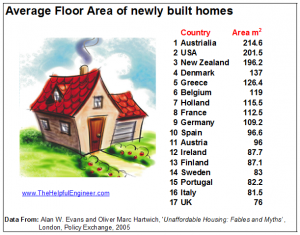 The average floor area of a house in the UK is nearly 3 times smaller than the average house in Australia. It’s hard to be sure what the reason for this is, as for example Holland is more densely populated than the UK but still manages to build larger houses. My own guess is that the strict planning laws in the UK mean that development land is at a premium which results in expensive land prices. This in turn forces builders to reduce the size of houses so that they can fit more properties into a given site and still be affordable for buyers. However the strict planning laws have benefits, I am always surprised whenever I visit the UK to observe the vast amount of unspoilt countryside. But more seriously Mitt Romney seems to confuse bigger with better. China is now overtaking the US to become the biggest consumer of the Worlds resources by virtually all meaningful measurements. It will also potentially have the biggest economy in the World within the next 5 years. If that happens I am sure that Romney will suddenly be emphasising that quality and not size counts. Benefits of small. Smaller houses have merit. Which include less cleaning, cheaper maintenance costs, lower fuel bills and perhaps less temptation to buy stuff which will simply clutter the house up. It is also easier to serve smaller and denser cities with public transport systems. If we are really serious about the environment and solving climate change we will have to change our outlook and remember bigger is not better, especially not for the future of our planet.